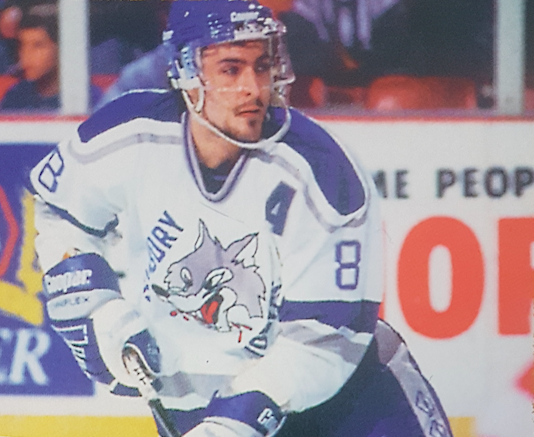 When Jamie Rivers thinks back to his final season with the Sudbury Wolves, he is almost astonished when he recalls what the team achieved that year. “I didn’t know we won 40 back then. Wow,” he exclaimed. Actually, the club racked up 43 wins that 1994-95 campaign. “Holy, that’s a lot of games in the OHL,” Rivers boasted. It was the first time the Wolves had reached the 40-win mark since 1978-79, and is something that has not been accomplished since, although this year’s team is just three wins shy with nine games remaining. Following their regular season success that year, Rivers’s Wolves made a deep run in the playoffs, advancing as far as the semi-finals before falling to the Detroit Jr. Red Wings in a hard-fought seven game series. The Red Wings went on to capture the OHL championship, while Rivers wrapped up an incredible junior career in Sudbury that was highlighted by a 121-point season, a Wolves record for defencemen that still stands to this day. Reflecting on his tenure with the team, Rivers is reminded of those personal successes on the ice, but what still lingers with him after all these years, are the memories of his final playoff run. “We were never able to get the job done and win a championship. That was hard for me to get through because I wanted to bring a championship to Sudbury so bad for their fans,” he lamented. Although Rivers would have loved to have brought a trophy back to the Sudbury faithful, he wouldn’t have changed his experience. “Those were four of the best years of my life,” he recalled. When Rivers first joined the Wolves he was just 16 years old. Moving to a new city at that age can be quite daunting, but Rivers had some backup. His older brother, Shawn, who had just finished his first season with the Wolves and was returning for an overage year. It would have been easy for Rivers to room with his brother, but Shawn, being older and wiser, felt it was better for his younger brother to live on his own with a billet family and carve out his own place on the team. “That way I got to be Jamie Rivers and not just Shawn Rivers’s brother, who lives with his brother, goes to the rink with his brother and goes back to his little bubble,” Rivers explained. He heeded his older brother’s advice and it turned out to be the right decision. Rivers ended up living with a billet family, whose house was just across the street from another rookie, Sean Gagnon. “Neither of us had cars and Terry Chitaroni, who just lived down the street, would pick us up for practices and bring us home after. It really forced me to get to know another rookie and one of the co-captains that year, Terry Chitaroni, who is probably an all-time fan favourite in Sudbury. It was great for me to get acclimated that way,” he reminisced. Following his rookie season, Rivers returned to Sudbury determined to improve his game. “I wasn’t mad about the first year, but I was motivated to prove people that I was worthy of having been picked in the first round,” he explained. “When I went back, I was a little bigger, I was faster and I was a lot stronger. My confidence was higher. I knew I could play at that level,” Rivers added. Armed with that newfound confidence, Rivers registered 55 points that season and added 26 more in the playoffs before the St. Louis Blues selected him in the third round of the 1993 NHL Entry Draft. Before returning to Sudbury for this third season, Rivers made a detour through St. Louis. “I went to NHL camp and had a really great camp. So good that I thought they might keep me around here,” he recalled. The Blues ended up sending him back to junior, but Rivers was able to leverage that experience and apply to his game with the Wolves. “When they sent me back down to play in Sudbury it was almost like I kept playing at an NHL level. I felt like I was just a little bit faster, saw the plays just a little bit quicker and that when I was shooting the puck, I saw the opening and they looked just a little bit bigger for me. It was like the play was slowed down for me. That experience I got in St. Louis kind of set the stage for me to do better that season,” he explained. The confidence boost Rivers gained in St. Louis undoubtedly propelled his play in 1993-94, but even he had no idea he would have such a big year statistically. He just wanted the family bragging rights. “My goal was to beat my brother. He had 80 points his last year and my goal was to beat 80 points and then when I eclipsed it somewhere around January, I thought ‘who’s next?’ Let’s look at the list and keep going here,” Rivers laughed. Not long after eclipsing his brother, Rivers reached the 100-point in his 54th game, becoming just the 11th defenceman in league history to reach the milestone. By the time February came to a close, Rivers had racked up 37 points in 13 games was named the CHL Player of the Month. Rivers finished the season with 32 goals and 121 points to earn the Max Kaminsky Trophy as the OHL’s most outstanding defenceman. Despite his incredible play on the ice that season, Rivers still felt like he had something to prove heading into his final season with the Wolves. The previous year, despite being the league’s top scorer among defenceman, he did not receive an invite from Team Canada to join the World Juniors squad. “I was a little bit ticked at that. Believe it or not, that moment gave me a jolt to play harder and play better and do more,” Rivers remembered. His strong play continued and despite injuring his knee early into the 1994-95 campaign, Rivers finally secured his invite from Team Canada, and went on to win gold at the World Juniors. “It gave me a big jolt for the rest of the season to play well and do well. I remember wanting to bring a championship to Sudbury really bad,” he reflected. In the spring of 1995, Sudbury was abuzz with excitement as the Wolves were set to enter the post-season. Rivers remembers that during his first playoff run, in 1992-93, people were lined up down the street as far as the Ledo Hotel to secure playoff tickets. “We had a full house, four or five rows deep up top [in standing room only]. It was kind of like that every year,” he noted. For his final playoff run, however, Rivers believed it felt different. “I think everybody thought we could do it. I remember it being just so jammed pack and how loud our building was and how other teams hated coming to Sudbury. They hated the wolf coming down in the rafters when we scored,” Rivers said. After vanquishing the Kitchener Rangers in the first round, the Wolves went on to play the Windsor Spitfires. The Wolves had their work cut out for them taking on a big, physical Windsor team that included Ed Jovanovski and David Roche. Despite the physical play and gruelling travel schedule, the Wolves won the series on the road in overtime in Game 7. By the time they reached the semi-finals, the travelling had begun to grate on the team. “You’re young and don’t realize it, but it wears on you. It’s not an excuse but we were young kids and I think that did get to us a little bit,” Rivers recalled. The Wolves ended up taking the Detroit Jr. Red Wings to seven games in the semi-finals, but their best opportunity to close out the series was at home for the sixth game. “That was a heartbreaker,” Rivers lamented. “It was in Sudbury and we were ahead 3-2 in the series. We should have closed it out. We had opportunities, we had power plays, we had chances, especially in our barn to at least send it to overtime. That was our chance to win,” he continued. Although the result didn’t go their way, the team left it all out on the ice that game. “We treated it like it was Game 7, so we were physically and emotionally drained when we didn’t win that game,” he recalled. When the series shifted back to Detroit for the deciding game, Rivers felt the letdown from Game 6 was too much to overcome. The Red Wings clinched the series and went on to defeat the Guelph Storm to win the OHL championship. Rivers may have come up short in his final post-season, but he will never forget those playoff runs in Sudbury. “It was an electric atmosphere. Honestly, it’s the closest you can get to playing in the Stanley Cup Playoffs, is having played playoff hockey in Sudbury in that era,” he beamed. While Rivers’s OHL playoff dreams unfortunately never came true, the Wolves currently find themselves in position to finish with the most successful season in nearly a quarter-century. With the playoffs just around the corner, the squad will have their own opportunity to etch their names into Sudbury hockey lore and make good on what Rivers had always hoped to achieve.